Still Roger goes for his swim at 13 degrees Celsius..
to wear ear muff! The fishermen may trawl, use nets or just bottom fish. Halicarnassus, in about 350 BC. taken from some Egyptian mummy! it was spring, wonderful wildflowers everywhere. 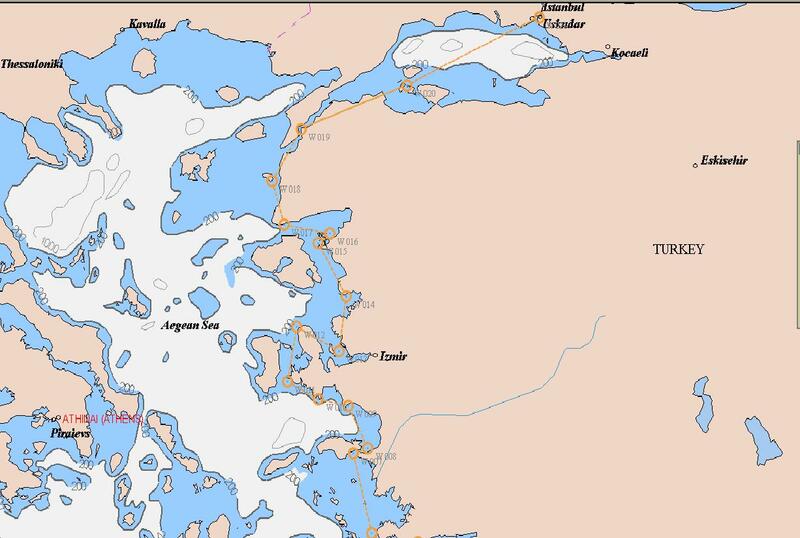 died out completely, to Alibey Adasi and the area generally known as Ayvalik. no fresh mussels for Sasha's specialty, chili mussels. jar. The jars looked about 100ml which took quite a number of sea urchins to fill. hand tools like sickles and seethes. gear and set off for Korkut headland and up to the peak, about 200m. turned into a fantastic dinner of chili mussels by chef Sasha. and New Zealand Army Core). ferry and bus ride away. First up Troy. tracing the cities history back to its beginnings 5,000 years ago. small glasses of local white wine and Çay, all for the princely sum of 14tl! home and enjoyed with a lovely bottle of South African Chenin Blanc. enclosed in a whicker basket, very traditional, had to have one. we made it still with a few days to spare for Istanbul sight seeing. into the tourist centre of Istanbul. Pattie and James for a couple of quiet beers. One of the "must dos"
view and being spring flowers out everywhere, a gorgeous day. museum almost 2 centuries ago. Roman emperors of which there were hundreds. interior walls, which creates an impression that the dome hovers unsupported.